The ultimate of bird swings where your bird will feel like they are the King or Queen of the Jungle. Made with a sturdy wooden 1.25" square perch and ensconced with all different size wood slices for the ultimate of wood chewing pleasures. This bird swing will be your Feathered Friends favorite retreat from a busy day. Our Severe Macaw Buddy just loves to sleep on his Lumberjack swing because it gives him a chance to stretch out his feet from a busy day. Bird swing measures: 13" long from top of swing pear links to bottom of wooden perch. Actual perching width is 12" wide. Lumberjack Bird Swing for Amazon/African Grey Parrots5Mark K.March 10, 2018This is the best FunTime Birdy decision I made for my African Grey. This swing has lasted a long time. 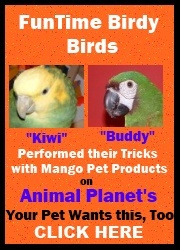 I would highly recommend for your bird as an alternative to regular perches. Lumberjack Bird Swing for Amazon/African Grey Parrots5Mark K.February 1, 2017My African Grey was cautious at first but uses it regularly now. Lumberjack Bird Swing for Amazon/African Grey Parrots5MargaretApril 7, 2016My bird is enjoying his new bird swing. Great product for the price.